This product has activities that focus on subject/verb agreement. 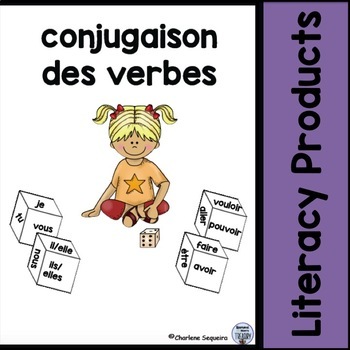 The following verbs: aller, être, avoir, faire, pouvoir, vouloir are included with the pronoun/verb agreement and some sample sentences for each of the pronouns. The English translation is given and the French pronouns need to be added. A page is also included with all six verbs conjugated. 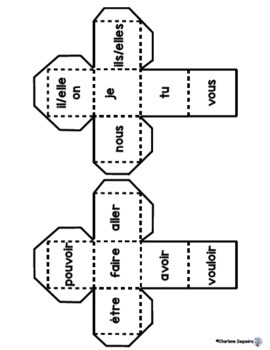 There are some templates included for making dice - one for pronouns, one for verbs and two blank ones. Six pronouns and six verbs have been provided. The dice are used to practice matching the pronoun with the correct form of the verb. 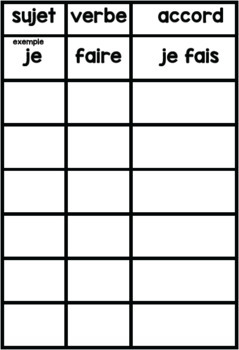 A chart is included for recording responses from the dice game. A page is also included that has 2 charts if required. 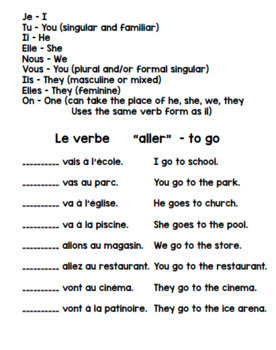 One page of sentences with the verbs provided is also included. The correct form of the verb needs to be added. I hope this product helps with practicing how to conjugate verbs.